The Travelon Anti-Theft Signature E/W Slim Bag is designed perfectly to keep your essentials secure and safe, while offering a slim profile and stylish look. It has zip front compartment with RFID blocking card and passport slots. This bag comes with an adjustable strap and has a roomy main compartment with wide zip opening that provides full access to the bearer of the bag. The Travelon Anti-Theft Signature East-West Slim Bag has many exciting features for users of all types. You can extend the lifetime of your Travelon Anti-Theft Signature East-West Slim Bag with the purchase of a FactoryOutletStore Factory Protection Plan. 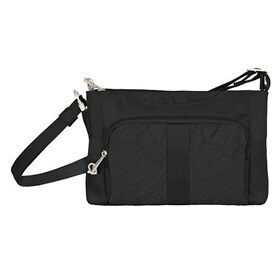 See the Travelon Anti-Theft Signature East-West Slim Bag product video above for more details. FactoryOutletStore stocks a full line of accessories like Boarding Pass Holder, Eye Mask, and Safe ID Classic Passport Case for the Travelon Anti-Theft Signature East-West Slim Bag. The Travelon Anti-Theft Signature East-West Slim Bag is sold as a Brand New Unopened Item.